As always, there was a friendly atmosphere in Saint Louis on the last bivouac as the participants were joined by their friends, partners and family. 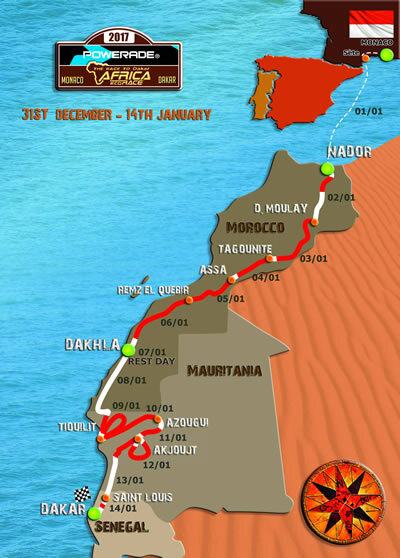 After a night under the magnificent starry sky of Senegal, at 8:00 today, Saturday January 14th 2017, the first motorcycle took the start for the last liaisons of the 2017 AFRICA ECO RACE® long of 292 km to Niokhob, a fishing village on the shore of the Atlantic Ocean. It was from the beach that the start of the final stage was launched. A sprint, for the glory only since the classification were frozen from the previous day, in Bikes, Norway's Pal Anders ULLEVALSETER won, just in front of the Israeli Gev SELLA at 9 '', both on KTM. The Italian Paolo CECI places his HONDA in 3rd position at 1'12 ''. In Cars, by being performant since the beginning of the Rally, Guillaume GOMEZ did not miss the opportunity to shine one last time. The Frenchman won with his OPTIMUS Buggy ahead of Pascal THOMASSE, also on OPTIMUS at 30 '' and Jean Antoine SABATIER at the wheel of his BUGGA ONE at 46 ''. At the end of this special, all the winners of this edition of AFRICA ECO RACE® were rewarded, celebrated and photographed under the finish arch. A ceremony that was organized with the presence of members of the Senegalese Auto and Moto Federation, representatives of the Ministries of Sports and Tourism, local elected representatives and partners of the 2017 AFRICA ECO RACE®. Everyone agreed that this 2017 edition was an absolute success and of course promised to return in 2018 for the 10th edition of the AFRICA ECO, the one and only race to Dakar!